I was on staff from November 1993 through November 1995. 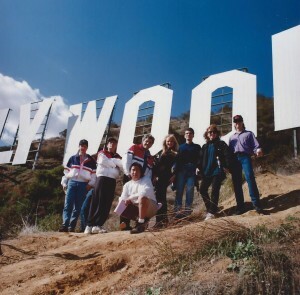 Behind the Hollywood sign in July 1993. Clockwise from me, with the football: Dave Rygalski, James Baldwin, Fred Wolf, and Andy Aaron. 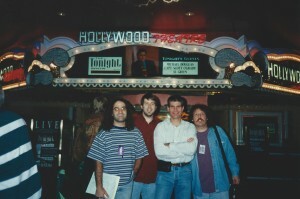 Right before I joined The Tonight Show as co-head writer I held the same position on The Chevy Chase Show. Chevy’s show only lasted on the air five weeks but the writers and I had some fun. One day we went up to the Hollywood sign to explore the possibility of Chevy tossing a football through the D.
We never managed to produce the Hollywood sign comedy piece for Chevy’s show and it became my Great White Whale. I conquered the piece seven months later on The Tonight Show: I had Jay coach Charlie “Major League” Sheen in throwing a baseball through the D. See my blog post “5 Reasons To Do Field Pieces” for more photos. 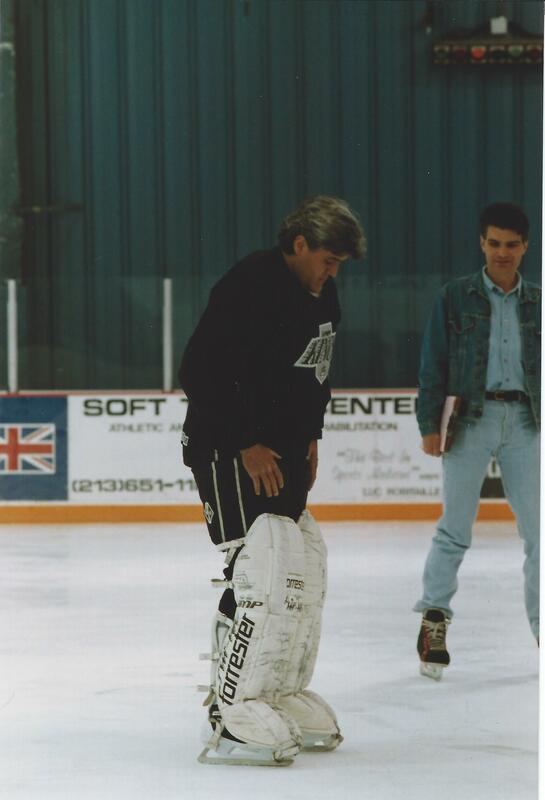 Jay and I take to the ice with the LA Kings, March 1994. Jay was always up for pretty much anything that might set him apart from the late-night competition. 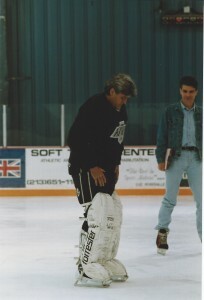 For example, for one comedy piece we went out to the rink where the Los Angeles Kings hockey team practiced. Jay suited up as a goalie and we taped the players nailing him with slap shots. At my desk with writers (clockwise from me) Peter Sears, T Sean Shannon, and Mike Colasuonno, November 1995. 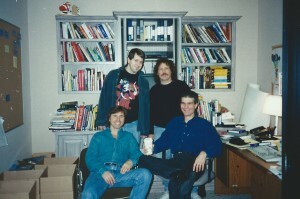 The other co-head writer, Joe Medeiros, and I shared an office next door to Jay’s. Jay’s door was literally always open, which made it easier for us to pitch comedy ideas and keep the show well-stocked with material. 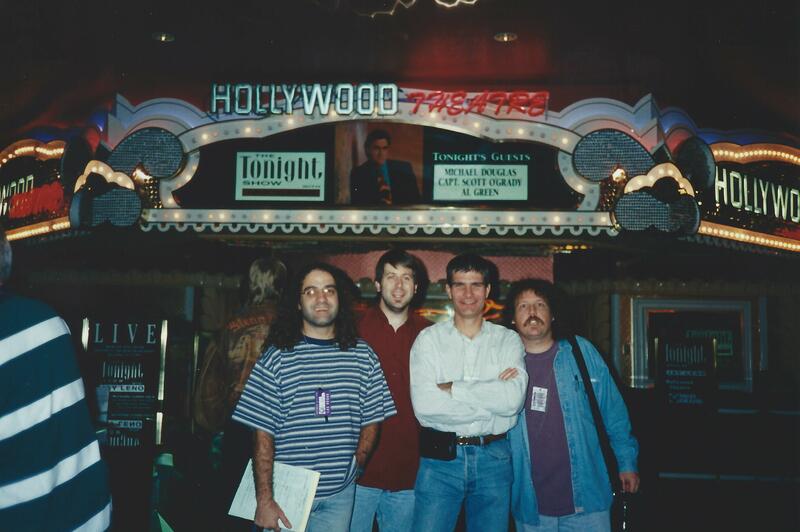 Las Vegas, November 1995. 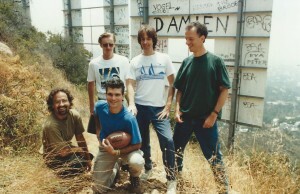 Writers L to R: Dave Rygalski, T Sean Shannon, me, and Mike Colasuonno. Just before I left Tonight to relocate back East we did a week of shows in Las Vegas at the MGM Grand. Vegas is always fertile ground for comedy, with plenty of relatable topics and colorful environments. I also did shows there on Late Night with David Letterman.